BEIRUT, May 28 2009 (IPS) - In Lebanon’s Jun. 7 parliamentary poll, women represent only two percent of the candidates, many of them with family names that have been appearing on ballots for generations. Names like Geagea, Hariri, Zwein and Tueni are as recognisable in Lebanon as Gandhi in India or Kennedy in the United States. In the tumultuous landscape of Lebanese politics, the death or assassination of a male family member is often the reason women are thrust onto the political stage, to preserve the family legacy. "There is a common phrase in Lebanon that the only way women enter parliament is in their mourning dresses," Abla Kadi, project coordinator for a UNDP-funded initiative promoting participation among women in the current elections, told IPS. Kadi and others believe that for women to be viable candidates in Lebanon’s ‘confessional’ system, where seats are distributed based on religious sect, they need political backing, financial support and, above all, the right family ties. One female candidate expected to win the lone Greek Orthodox seat in Beirut’s predominantly Christian district is Nayla Tueni. When six women were elected to Lebanon’s 128-member Parliament in 2005, female representation doubled to an all-time national high of 4.7 percent. This figure falls far short of the 17.2 percent global average and ranks Lebanon 125th out of 136 countries in terms of female parliamentary representation. To rectify this representational imbalance, the 2006 National Commission on Parliamentary Electoral Law Reform (known as the Boutros Commission) suggested that each party list in the proposed proportional representation constituencies include at least 30 percent female candidates. 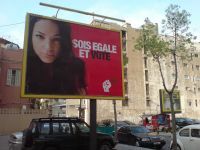 When the Boutros Commission’s proportional representation system failed to be implemented in the Parliamentary Election Law adopted in August 2008, the proposed female quota was shelved. "If we argue against this, it’s like we’re arguing against the peace of Lebanon," Yarra Nassar, executive director for the Lebanese Association for Democratic Elections, told IPS. "We began with all these reforms and then we had to change our tactics, which was a bit of a de-crescendo." Abla Kadi, coordinator of a UNDP project, believes a quota for female candidates should be implemented temporarily. "We don’t believe in the quota as a permanent solution, but we believe that it will be a stepping stone toward accepting female representatives in parliament," Kadi told IPS. 2009 candidate Nayla Tueni worries about the precedent such a quota would set. "What would be more helpful is for the women to call on their parties to field female candidates for the elections, not to wait for men’s approval to get confidence," she feels. To date, no party has adopted a voluntary quota for female candidates. "If a party says they will implement a voluntary quota of 20 percent female candidates when their opponents have better candidates who are men, they are kind of suiciding themselves," MP Gilberte Zwein’s son and campaign manager Jean-Michel Abouhamad de Tarrazi told IPS. Zwein proposes that 10 percent of seats in Parliament be reserved for women. "If the quota is only for candidates and not seats, parties will only put women in races they are sure to lose. There needs to be a quota for seats," Tarrazi told IPS. The Boutros Commission’s report voiced apprehension for such a quota. "Quota at the candidacy level would be much more in harmony with the voter’s freedom than a quota imposed on seats …," the report states. Nassar remains optimistic. "Total reform is a process. You can’t get everything you want the first time around," she told IPS. According to Nadim Houri, Senior Researcher at Human Rights Watch in Lebanon, "The larger responsibility lies with Lebanese society to make it a higher priority for women to be in parliament and to be represented in higher echelons of power." According to the Boutros Commission’s report, "The rationale for this obligation is that women have not yet had a fair chance to participate fully in the political life of the country despite the recognition of their right to vote and run for office more than 50 years ago." Tueni’s father Gebran was assassinated six months after being elected in 2005 to the seat she now seeks. Nayla is deputy manager of An-Nahar, Beirut’s leading newspaper founded by her great grandfather and formerly edited and published by her father, and is supported by the Western-backed March 14 Coalition. "My family’s history and the new situation we found ourselves in after the martyrdom of my father influenced my decision. Had my father been alive, I wouldn’t have thought of running for the elections," Tueni told IPS. Even with the competitive edge afforded by her family name, securing a seat in Parliament the first time around is far from guaranteed. Gilberte Zwein discovered this in 1996 and again in 2000 when she was defeated in her home district of Keserwan. She was finally elected to Parliament in 2005 and is vying to maintain her seat as the only female MP endorsed by the Free Patriotic Movement. The Zwein political dynasty extends back to Gilberte’s grandfather who served as a member of Lebanon’s first parliament when Lebanon gained independence in 1943. Her campaign manager and son, Jean-Michel Abouhamad de Tarrazi, told IPS that his mother’s interest in politics began at an early age when she managed her father’s successful Parliamentary campaigns. "The family name is a necessary condition to success, but is not in itself sufficient. Just because you are the daughter of someone does not mean you will be elected. Today, people are voting more and more for candidates with clear political programmes," Tarrazi told IPS. As Head of the Lebanese Commission for Women’s and Children’s Rights, Zwein has worked to increase women’s political stake in Lebanon. "It is more a matter of making women conscious of the role they have to play than actual legal barriers standing in their way," Tarrazi told IPS. Legal barriers may not explicitly block women from reaching parliament, but societal norms create gender specific hurdles that have historically limited their success. "The real problem for women is that we are a non-feminist society. We see men as more important than women in Parliament," Yarra Nassar, Executive Director of the Lebanese Association for Democratic Elections, told IPS. In 2009’s contentious election pitting a Hezbollah-led opposition against the Western-backed ruling majority, most female candidates are running independently without support or endorsement from either alliance. One such candidate, Therese Rizkallah, is a former colonel in Lebanon’s General Security intelligence agency campaigning for one of three Maronite seats in Baabda. Rizkallah says she has faced sharp criticism from men and women on both sides of the political divide. "Many people say to me, ‘Now is not your turn. You are an independent female candidate in an Arab country.’ They said the same thing when I joined the army, but if women can fight like men, why can’t they represent their country?" Another independent candidate, Hoda Sankari, 28, is a pharmaceutical representative running for one of five Sunni seats in Tripoli. She told IPS that her main objective is to break the Lebanese tradition that women in power must come from politically oriented families. At a roundtable meeting that brought together 14 candidates in Tripoli mid-May to discuss women’s issues, Sankari in her tight red sweater and matching purse posed a sharp contrast to the sea of black suits surrounding the lone female candidate. Sankari, who says her conservative Muslim family has been vocally apprehensive about her decision to run, told IPS: "We (women) need to take the initiative to go after what is rightfully ours." Rizkallah shares Sankari’s sense of obligation to represent all Lebanese women. "Maybe I don’t have a chance in this election, but if I get even 100 votes, that means I’ve made a difference," Rizkallah told IPS. "If I lose this time, I will run again in 2013." Sahar Choufi, 19, is studying Political Science at the American University of Beirut and has toyed with the idea of one day running for a seat in Parliament. She applauds Sankari and Rizkallah for their perseverance. "Not many women take the initiative to run because they know they’re going to lose. We have to start somewhere to actually move forward. We need these pioneers," Choufi told IPS.